So ready to learn something new and dangerous and cold. Someone once told me that learning a new, physically demanding, and dangerous activity is best done before the age of 30. Well I’m 33, and last month I went snow skiing for the first time in my life. And I successfully came back from my first ever ski trip without any broken bones or torn muscles. Bruises, well I had a few of those. Me and Crystal as we learn to ski. When my best friend, Crystal, and I were deciding where to take a winter vacation this year, skiing came up, but was ruled out because it is so expensive. But on Black Friday, Angel Fire Resort ran a special for half off the cost of the room and we could bundle our lift tickets for six days for half the price. The only catch was the discount on the room had to be used in a two-week window. Neither one of us have children or any reason we couldn’t go one of those weeks, so we decided to try to learn a new sport together. Crystal and I arrived at Angel Fire, New Mexico on Jan. 31, and with the help of Winter Storm Kayla, we chose one of the best weeks out of the winter to be there. The storm came in that Sunday night, but fortunately for us it didn’t start snowing until we got there. Then it snowed nearly the whole day on Monday, giving us fresh powdery snow that ski bums covet. It did however, make temperatures lower than normal, and way lower than normal for us Arkansans. The resort strongly suggested we make reservation for our ski lessons, which we did. We chose to do a half day in the afternoon. The resort had a few other options, but Crystal and I determined we could probably pick it up in a half a day. 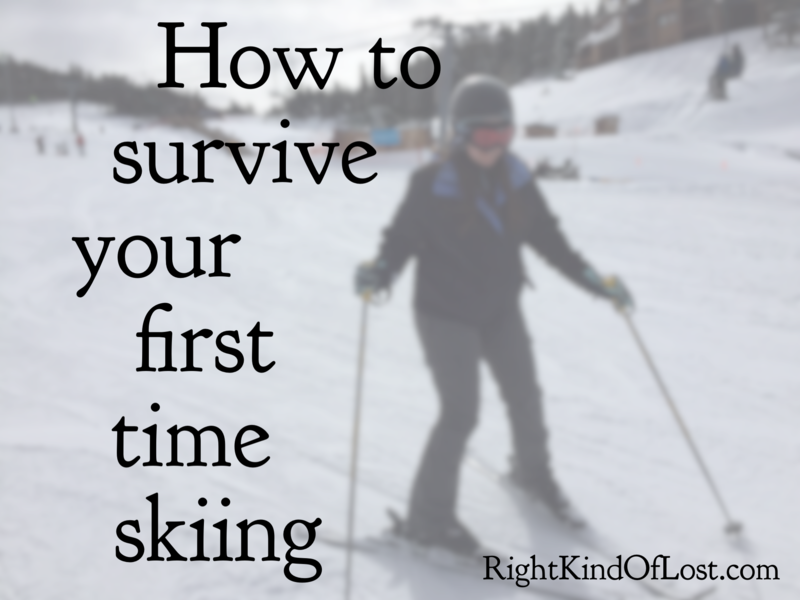 Before we went, I semi-joked with my friends and coworkers who had been skiing before, “Do I really need lessons? It doesn’t look that hard.” But the answer was unanimous, “Yes!” And boy was I glad we took them. Skiing it turns out is a lot more than gliding down a hill. We learned to lean into our boots with our shins, as well as how to lean to make a turn. And the most important aspect of all, how to stop. The first time I fell, we were in the ski school area and the snow was nice and soft, but outside the snow was not as fluffy and forgiving when we fell. Crystal was the first to have a mishap on the lift. Learning the lift takes coordination, and, well, we are not the most coordinated. On our second time on the lift, our instructor was picked up by the seat in front of us. Crystal and shuffled to the place to wait for the two-seat lift to scoop us up. I felt the chair under me and grabbed the pole, then I heard this clunk noise. I went to look at Crystal, but she wasn’t there. As the lift climbed, I turned my head back to watch Crystal grow smaller on the ground. Crystal riding in the chair behind mine after she fell off of the lift. The lift attendants were quick to stop the lift and help Crystal up out of the snow. She was able to get onto the next chair, then our instructor was able to give us advise as we skied, slid, rolled, and walked down the hill. I can’t give Crystal too much grief about falling off the lift, because the next day I was the one who dropped my ski pole on the first ride and then my glove on the second ride. I quickly learned that if you are not use to the lift, you do not need to be trying to take selfies. For my pole I was able to ski down half of the way with one pole and then retrieve it from under the lift. My glove, on the other hand (no pun intended! ), we had to send not one, but two ski lift attendants to retrieve it. I was ready to buy a new pair, but they were able to find it for me, and I was so grateful! As we learned to ski we fell a lot. Skiing is much more enjoyable after you learn not to fall as much. It not just the fear and pain as you hit the ground, which I thought falling in snow it would have been softer like it was in the ski school area, but the struggle to get back up. Once standing in line for the lift with our instructor, I fell just standing there. My legs were in a back bend position, but my back was flat on the ground. With the skis on, I was stuck and helpless to get up. Fortunately the ski lift attendants were quick to come and grab my hands and pull me up. Falling wasn’t the most frustrating part. It was trying to get back up with extra long boards strapped to our feet. Sometimes we would flail around in the snow like Randy in “A Christmas Story.” Our instructor informed us that taking one ski off before getting up was the best way to do it. After enough falls, I took it a step further and started taking both skis off. Every once and while Crystal and I would have to release a ski for each other because the position we fell into made it difficult to reach. This is how I would try to get my ski off so I could stand back up. One thing I found tricky in learning to ski was how slick the skis were on the snow. It is a lot like the feel of ice skating for the first time. We found taking lessons together to be helpful because the next day when we couldn’t quite remember what our instructor said we could ask the other one. Our instructor was very nice and took a picture of the two of us. Crystal and I hauled our skis, which were heavier than we thought, from our room to the base of the mountain. We attempted to ski to the Dream Catcher lift, the beginner lift we had used the day before. Even though we were informed how to go uphill in skis by our instructor, digging the edge of your skies into the snow as you sidestepped up, it was still difficult and we slid backwards a few times. The next time we had to make that hike, we carried our skis and put them on at the line for the lift. On our second day of skiing, we clung to the beginner slopes trying to perfect our skills. We made a joke that whoever fell first had to buy the other a drink, however we both fell at the same time. Crystal took this picture of me after we got off the Dream Catcher lift. Crystal on our last day perfectly demonstrating how “pizza wedge” is keeping her from rolling down the hill. After few runs we decided to warm up in the Village Haus, a cafeteria-style restaurant, with hot chocolate. At first we were not enthused about a cafeteria, but the food was very tasty. Warming up with some hot chocolate at Village Haus. We discussed calling it a day and going back to the room, but after we were warm decided to go back out for one more run. That run was much better as we were improving, so we decided to do it just one more time. After that we were pretty frozen for the day and decided to go back to the room where we had a fire place. On our third day at Angel Fire the winter storm had moved out and we were a little sore. We determined later that we were not actually sore from skiing, but from the falling. Angel Fire Resort is about a 40 minute drive (on snowy roads) to Taos, N.M., which is on one of my favorite areas. The Enchanted Circle, an about 100-mile loop that connects Taos, Angel Fire, and Red River, and circles Wheeler Peak, the highest peak in New Mexico. I had driven it when I visited the area before and it is one of the reasons I fell in love with the area. Wheeler Peak from the outside of Taos. Trying not to be the stereotypical Southerners that cannot drive in the snow, Crystal and I ventured out on the Enchanted Circle toward Taos. The drive was beautiful in the snow. Crystal bundled up in Taos. At Taos, we ate at Michael’s Kitchen which was recommended to us by a coworker. It was heavenly. We walked in engulfed by the smell of fresh cinnamon rolls that were the biggest I have ever seen. The food is typical New Mexican, and of course we ordered something with the state’s signature green chilies. After lunch we explored Taos by foot, and then we explored it by car, mostly because we got lost. We continued around the circle taking in the breath-taking scenery, stopping in Red River to do some more shopping. Skiers on the slopes at Red River. For dinner that night, we split one of Michael’s Kitchen’s enormous cinnamon rolls. On Thursday we went to the equipment rental shop and only rented for that day because we were not sure if our ability would allow us to ski again on Friday. There was a long green circle slope called Heading Home that was our ultimate goal. We wanted to perfect the Dream Catcher and High Road runs, the beginner slopes, before we tried a longer one. A map of the runs can be viewed here. After we felt comfortable enough with those two, we moved on to Lift 2 and down the Ridge Run to High Road run. On Ridge Run, it makes a curve as it turns into the High Road that was steep. I nearly busted it every time going down that hill. From there the trail goes into a wooded area, and that was my favorite part of the whole trip. It was where I felt the most comfortable. We also took a lunch break at Village Haus that day to warm up before heading back out. At the end of the day we decided to ski the Dream Catcher run one more time. When we both got to the bottom we both were so excited out how awesome it felt. I felt like we flew down the hill with ease. We had to do it one more time because it was so much fun. Dream Catcher run for beginners. On Friday when we went back to the equipment shop, the clerks gave us funny looks and asked us why we didn’t rent our equipment for two days. Crystal and I exchanged sheepish looks and confessed we weren’t sure we would be up to one more day of skiing. The view from the top of Lift 2. We skied the Ridge Run to the High Road a few times before working up the nerve to tackle Heading Home via the Chili Express lift. The Chili Express takes you to the top of the mountain and is a much longer lift. It also seats four as opposed to two. I swung my feet back and forth because sitting for so long made my feet cold. For some reason, I was much colder on this day despite the temperatures being warmer. The view with Wheeler Peak from the top of the mountain. As we exited the lift I did not do something right and fell right off it. My first thought was to stand up but I didn’t want the next chair to knock me down. The lift attendant again was very helpful and quick to get me moved out of the way. Crystal thought this was especially funny since she had fallen several times trying to get off, mostly because I ran her off the trail or stepped onto her ski. The view from the top was amazing. By Friday the skies had cleared and we had awesome views of Wheeler Peak. The Heading Home run is much longer and took us longer to get down. There were a few spots where it was steep, but mostly it was fairly easy. I fell a few times and I could definitely tell that the previous day of skiing had made my muscles sore. After we were back at the bottom we took a break for lunch before loading back up on the Chili Express and trying it again. At the end of the day, we skied the High Road one last time to end our trip on a high note. Skiing for me was challenge, but once I got the hang of it I loved it. Sometimes it was little colder than I would have liked, like -13 degrees, and sometimes it hurt a little more than I liked when I fell. But I honestly loved every minute of it, and wouldn’t trade the experience for anything. I also thoroughly enjoyed learning something new with my best friend. It was a great break from my everyday life.